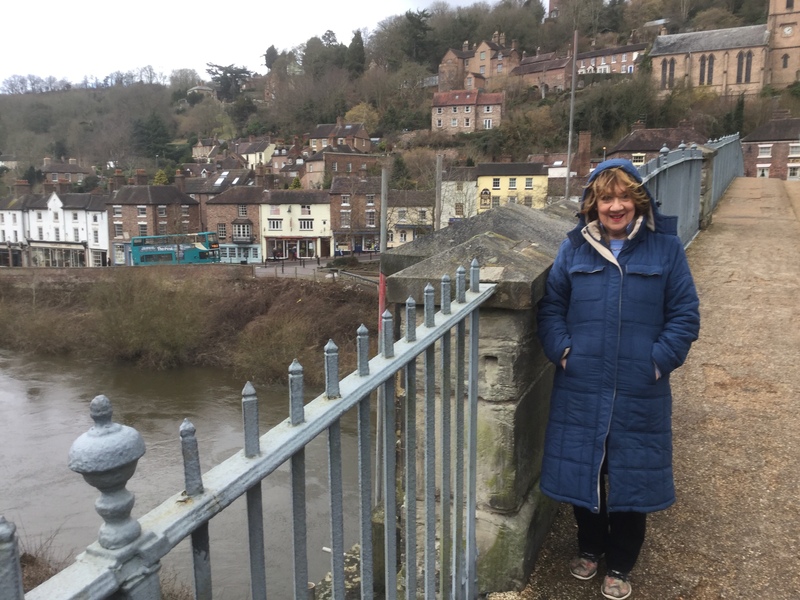 Over the Ironbridge with Elizabeth Fry! It was a thrill walking over the River Severn on the famous Ironbridge near Telford in Shropshire. I was walking in the steps of Elizabeth Fry. Construction of the bridge – the world’s first major cast iron bridge – started in 1777 and took two years to build. It opened to the public– pedestrians and horse-drawn vehicles – in 1781, a year after Elizabeth was born. She visited the area and crossed the bridge as a teenager. It must have been hard for her with her deep fear of water to walk above the rushing water on the decorative iron bridge. Even then the Severn was subject to flooding, and there is a wonderful photograph of the river frozen solid in February 1917. An icy wind was blowing when we visited the Ironbridge Gorge Museums in February 2018 and part of the iconic bridge was wrapped up for a structural facelift. Well, actually, a £1.2m restoration project started last year, the biggest piece of conservation work ever undertaken by English Heritage. Hats off to English Heritage. For, not only is Ironbridge the birthplace of the industrial revolution, is is now an award-winning World Heritage Site – and rightly so. It is precious indeed. My first impression was: where to start? Where’s the centre of everything? We got lost trying to find a way in, not knowing quite what to expect. 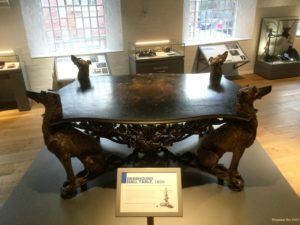 We got lucky and our first visit was to the Museum of Iron, known in the past as the Great Warehouse and built by the Coalbrookdale Company in 1838 (with a slightly incongruous clock tower built five years later). David Harris, who describes himself modestly as ‘front of house’, and his colleague Matt put us in the picture. With maps and their knowledge, I realised a single visit wasn’t going to do it at all! There are no less than ten museums so a lot of walking and driving was needed. Fortunately, there are plenty of car parks, well in winter at any rate. It’s basically a village community along the Severn from Coalbrookdale, Ironbridge, Broseley, Jackfield, Madeley and Coalport. And of course Blists Hill Victorian Town. 1. The Museum of Iron – three floors of fascinating stuff including the fabulous deerhound hall table. 2. The Ironbridge itself plus the little Tollhouse Museum– you can still walk over the bridge during its renovation. 3. 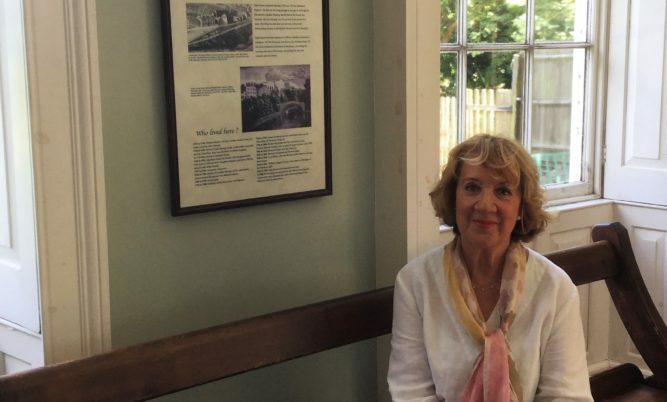 The Museum of the Gorge – includes a meticulous model of past life on the Severn bank and a short film on the history of the place. 4. Enginuity – great, fun, hands-on activities like moving a locomotive by hand, generating electricity; couldn’t get my boys (actually men) out of there! You know how they say you should always have a reason to return? Well, we do. The remaining six museums were either closed or we ran out of time. 5. The Darby Houses – where Elizabeth Fry visited and found her Quaker vocation with Deborah Darby – include Rosehill and Dale houses and, further up the hill, the Quaker Burial Ground. Closed in winter. 6. Tar Tunnel– where miners in the eighteenth century struck a bitumen spring which still oozes tar. Closed in winter. 7. Broseley Pipeworks – where the pipes were made for Victorians to smoke. Some are outlandishly long! Closed in winter. 8. Coalport China Museum– where dainty treasures were made in unlikely surroundings. Great teapots! 9. Jackfield Tile Museum – keeping ahead of the game, the innovative Darby family turned their hands to tile making, with some spectacular results. 10. Blists Hill Victorian Town – We were told we’d need a full day just to enjoy this ‘museum’ which is, in fact, a little village. I look forward to returning in the spring and finding out more about the Darbys and also Richard Reynolds who married into the family and regularly hosted Elizabeth Fry. It was Abraham Darby I who first smelted iron ore with coke made from Coalbrookdale coal in 1709. As the business grew over the years, the deep Severn Gorge proved an obstacle between the local parishes. The river was a key trading route but the nearest bridge was two miles away at Buildwas. Abraham Darby III was commissioned to build the cast iron bridge in May 1776. Its span, after arguments, ended up 30.63m (100’6”). Its estimated cost was £3,250 but is thought to have been closer to £6,000 – much of the extra cost was covered by Darby himself. It became a toll bridge and proved very popular so no doubt he recouped some of his outlay. Deeply woven into the history of Ironbridge is a story of Quakerism. The Darbys were Quakers and they lived in the centre of their thriving business. Their beliefs influenced everything in life including the need to create an educated and loyal workforce. They built houses for some of their many workers; provided shops, brew houses, religious institutions, a mill, a laundry and schools for both girls and boys. They believed strongly in the education of girls– unusual at the time. Although non-drinkers themselves, they respected their workers’ enjoyment of a beer if not overdone. In the 1780s they created ‘Sabbath Walks’ around the dale to encourage workmen to walk with their families rather than spending too much time in the alehouse! 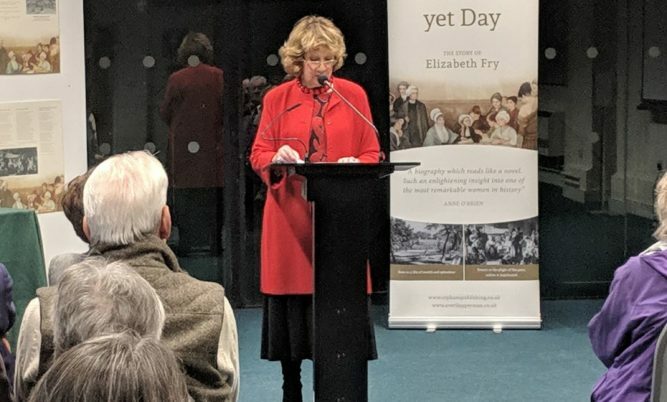 It was in this atmosphere of strong Quaker belief that Deborah Darby, a minister married to Samuel Darby, recognised the special qualities of Elizabeth Fry and helped her to see them for herself. Deborah predicted that Elizabeth would be: ‘A light to the blind, speech to the dumb and feet to the lame.’ Later Elizabeth told her diary: ‘I am to be a Quaker’. 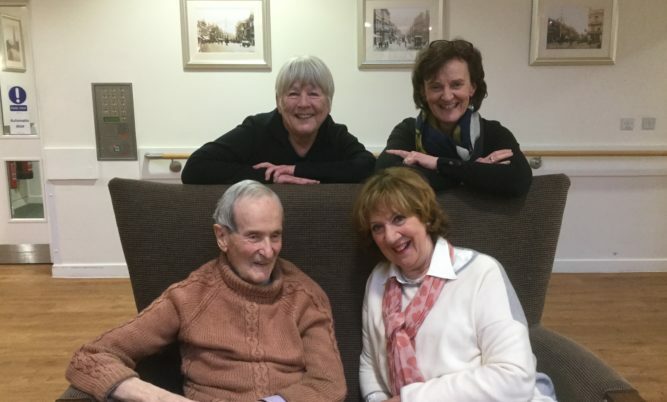 Her family were Quakers but ‘gay’ Quakers, enjoying music and dancing. 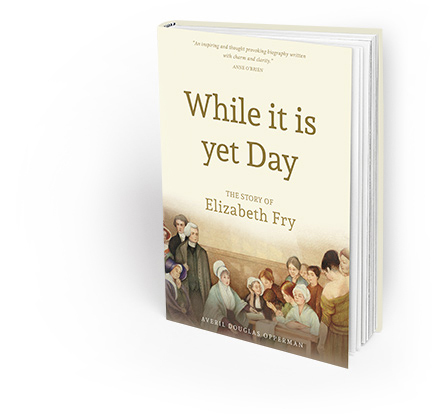 Elizabeth became a ‘plain’ Quaker giving up these pleasures – and others– for a more simple, thoughtful life.